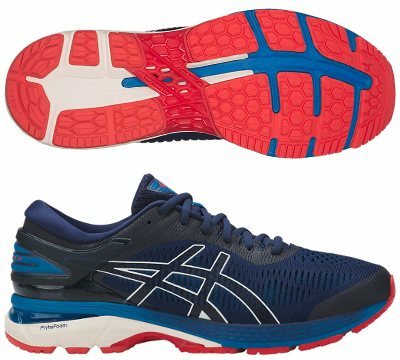 Asics Gel Kayano 25 are stability cushioned running shoes. Despite high price tag, the prominent Asics Gel Kayano 25 is one of the most appreciated running shoe out there even if target market is based on runners looking for top pronation control and plush cushioning made of best materials available, basically what premium means. For tighter budgets (and/or lower expectations) its smaller sibling GT 2000 6 offers great value for money and excellent performance, definitely worth a try. Back to current Gel Kayano 25, fans of the legendary series would find interesting those changes introduced from prototypes like MetaRun or disruptive Dynaflyte 2 to justify typical price update. Although there is no major change from its predecessor Gel Kayano 24, there are several minor ones. Upper introduces dual layer "Jacquard" mesh plenty of ventilation hole for increased breathability leaving FluidFit® fused elements to provide secure and custom fit, a similar solution applied in its popular sibling for neutral runners Gel Nimbus 20. Heel counter (MetaClutch™) has been redesigned for improved stability and ComforDry X-40 sockliner not only enhances interior's dealing with odour and moisture but also increases comfort with softer feel. There is available a Lite Show™ edition with higher density of reflective elements from 3M® to improve visibility on low light conditions. Unbiased feedback from several users blames original FlyteFoam for excessive firmness so Asics engineers decided to split it into two pieces in current Gel Kayano 25: on bottom of midsole and spreading from rearfoot to midfoot, FlyteFoam Lyte pad features softer cushioning and above it, full-length layer of FlyteFoam Propel offers more bounce for such heavy running shoe (please keep in mind it would not be as responsive as Noosa FF 2). Of course, a couple of embedded Gel® units are available in rear and forefoot for more comfortable shock absorption on impact. Regarding stability, Asics falls back on double density (Dynamic DuoMax®) foam for progressive pronation support and typical plastic piece in midsole (Trusstic System®) for valued stiffness. Outsole keeps typical vertical flex groove (Guidance Line®) for smoother ride and offers different rubber depending on the area with DuraSponge in the forefoot with slightly different lug pattern and AHAR+ in more exposed ones to increase durability.